A cancer diagnosis can quickly turn a person’s life upside down. For patients suffering from mesothelioma, there is not only the pressure of surgical intervention and harsh and expensive treatments, but also the knowledge that a dangerous workplace may have led to a deadly disease. Patients and their families can take control of their situation by learning more about the condition, including the causes, treatments, and complications faced by people with malignant mesothelioma. Malignant mesothelioma is a form of cancer that begins in the lining of the organs. Many internal areas of the body are covered in a layer of specialized cells called the mesothelium, which forms a protective covering that allows organs to expand, contract, and move against other parts of the body. Cancer starts to form when these mesothelial cells suffer damage to their DNA. Cells rely on the information in our DNA to tell them how and when to grow. If this information is damaged, dangerous cells form and replicate too quickly, killing off healthy cells. Pleural mesothelioma. 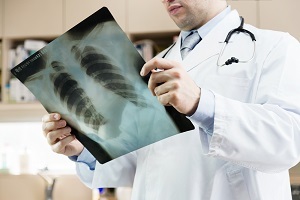 About 75% of mesothelioma cases involve pleural mesothelioma, affecting the lining of the lungs. Peritoneal mesothelioma. The second most common form of mesothelioma is peritoneal mesothelioma, affecting the lining and organs in the abdomen. Pericardial mesothelioma. These rare forms of mesothelioma begin in the layer of cells around the heart. Testicular mesothelioma. This form of cancer, tunica vaginalis, begins in the lining of the testicles and is very rare. One of the major causes of mesothelioma is asbestos exposure. When a person breathes in asbestos fibers, the fibers enter the lungs and cause scarring in the lung lining, affecting the cells’ DNA and resulting in pleural mesothelioma. Similarly, swallowing these fibers can cause damage to the abdominal lining, resulting in peritoneal mesothelioma. In many cases, people who formerly worked in industrial occupations with high levels of contact with asbestos are diagnosed decades after they were first exposed. Miners, plumbers, construction employees, automotive workers, factory employees, roofing and insulation installers, shipyard employees, and others involved in manufacturing or demolition may have suffered on-the-job asbestos exposure without realizing it. To make matters worse, families of workers in these industries can suffer secondhand exposure as the employee carries fibers into the home on his clothes, hair, or skin. The prognosis for people with mesothelioma will depend on a number of factors. First, doctors will perform tests to determine the stage of the cancer or how much the cancer has progressed into the body. Generally speaking, survival rates are higher in patients with earlier stage cancers. Size. The size and placement of the main tumor affects whether or not the tumor can be removed with surgery. If the cancer has not grown into organs, it will be easier to remove and increase the patient’s odds of survival. Lymph node involvement. Cancer uses the lymph system to spread throughout the body. If cancer is present in nearby lymph nodes, there is a good chance it has moved to other areas. Progression. Doctors must consider the extent to which the cancer has spread (metastasized) to other sites. The further a cancer has spread to another point in the body, the more difficult it will be to treat effectively. Once a cancer has been staged, doctors will have to consider personal and medical details to determine the patient’s chances of long-term survival. The patient’s age, gender, health, mobility, blood cell count, medical history, and other factors can all impact prognosis. In addition, the location of the cancer and the type of mesothelioma cells that make up the cancer can affect how well the patient will respond to treatment. The potential life expectancy for each patient is can vary widely but is almost always improved with specialized treatment. Mesothelioma is more difficult to treat than other types of cancer because of the way it grows, Rather than forming a single mass, small tumors connect into a sheet that spreads along the surfaces inside the body. The complicated nature of the treatment often results in higher costs, especially if the patient needs to travel long distances to receive care at a cancer center that specializes in mesothelioma. For this reason, patients are encouraged to consider filing mesothelioma claims that can ease the financial burden. There are many ways to receive payment for mesothelioma injury. Patients often qualify for Social Security disability’s compassionate allowance program, allowing them to receive expedited access to benefits. Military service members who were exposed to asbestos during deployment may collect disability and health care benefits through the U.S. Department of Veterans Affairs (VA). Finally, employees who were exposed to asbestos at work can file mesothelioma lawsuits against their former employers. Surgery. Some mesotheliomas can be removed surgically, depending on how far the tumor has progressed, its location, and the type of cancer cell. Chemotherapy. Many doctors recommend chemotherapy after surgery to kill remaining cancer cells that may have been left behind. Radiation. Patients who cannot tolerate chemotherapy may benefit from radiation therapy, which uses high-energy x-rays pointed at one part of the body to kill remaining cancer cells. Clinical trials. Patients sign up for these research studies and undergo new treatments or procedures under the careful watch of researchers. Clinical trials are a way for patients to access treatments that haven’t been approved for widespread use. Palliative care. Some methods involve treating the symptoms of mesothelioma rather than the cancer itself. Patients may need pain medications, visiting nursing care, or procedures to drain fluid that has collected inside the body. Alternative treatments. Alternative treatments may be used as part of a medical regimen or instead of traditional medical care. Many of these treatments help relieve symptoms, such as exercising, taking medications, diet and nutritional care, or massage therapy. The mesothelioma attorneys at Neblett, Beard & Arsenault represent victims throughout the state of Louisiana. We work on a contingency fee basis, which means we don't charge for our services until after your claim is settled. Our fee is based upon a percentage of your settlement, so there are no upfront costs required for you to get the legal help you need. Cancer diagnosis and treatment is often overwhelming, but we can give you the advice and representation you need to get the best care possible. Simply fill out the contact form on this page to schedule a free consultation, or call us at (318) 541-8188. To learn more about options, order our free eBook, Mesothelioma and Your Legal Rights.